Revised model arrives on 27 March 2017. Nissan Motor is launching the 2017 Nissan Terrano in India on 27 March 2017. Just two days ahead of the launch, leaked presentation images have revealed all the changes arriving with the facelift, courtesy CARS24.com. The 2017 Nissan Terrano will come in five grades: XLP, XED, XLD (O), XVD Pre and XVD Pre AMT. Nissan will offer the 2017 Nissan Terrano in five grades: XLP, XED, XLD (O), XVD Pre and XVD Pre AMT. Changes are mainly related to the equipment on offer. 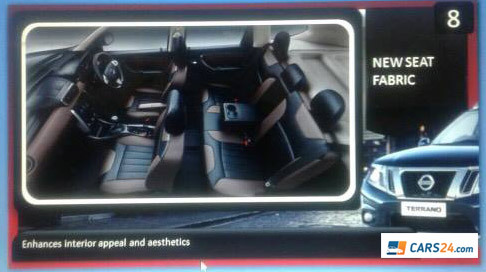 The facelift brings new door trim design, new seat fabric, new cockpit colour harmony, new design steering wheel, steering wheel audio controls, cruise control, touchscreen navigation and a new body colour. The Nissan Terrano will remain mechanically unchanged with the facelift. The current model is available with a 1.6-litre petrol engine that produces 104 PS and 145 Nm of torque and a 1.5-litre diesel engine that develops 85 PS and 200 Nm of torque/110 PS and 248 Nm (AMT: 245 Nm) of torque. 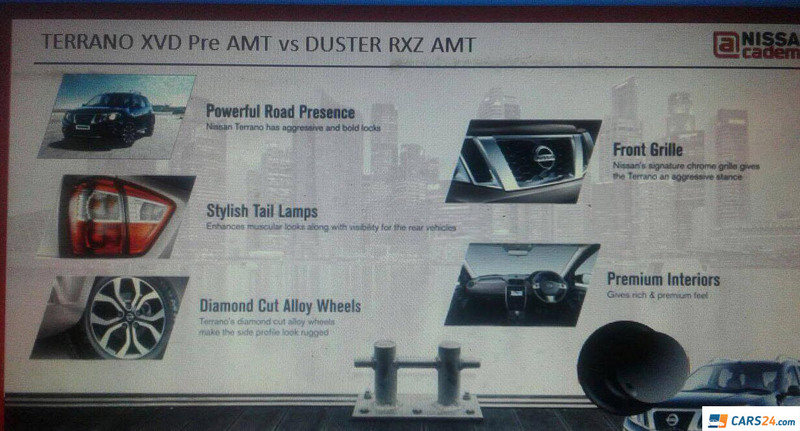 Transmission choices include 5-speed manual, 6-speed manual and 6-speed automated manual. The Nissan Terrano will get new seat trim and new door trim with the facelift. The Nissan Terrano currently starts at INR 9,99,000 (ex-showroom Delhi). The facelift could increase the prices slightly. The 2017 Nissan Terrano will rival the Renault Duster, Ford EcoSport, Maruti Vitara Brezza and Hyundai Creta. Will the 2017 Nissan Terrano (facelift) look like this?